Mr. Game 7 can do it all, apparently. Kings forward Justin Williams bagged the game-winner just 4:36 into overtime of Game 1 to give the Kings the 3-2 win and the early 1-0 lead in the series. It started out good enough for the Rangers, as they grabbed a 2-0 lead in the first inside the first 15 minutes of the game. Beniot Pouliot opened the scoring in the series at 13:21 on a breakaway, beating Jonathan Quick stick-side with a wrister. Carl Hagelin doubled the lead twelve minutes later when too had a breakaway, with his shot deflecting off the skate of Slava Voynov and past Quick. But these are the Kings we're talking about here, and they didn't blink for a minute facing another deficit. Kyle Clifford got one back late in the first period to cut the lead in half, and Drew Doughty scored on a highlight-reel goal early in the second period to tie things up. 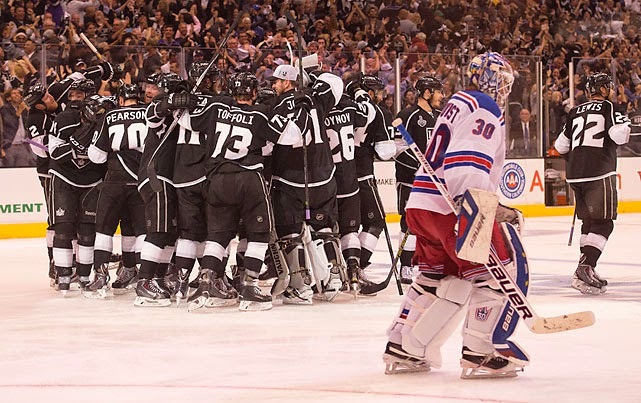 The game remained tied through the third period, where the Kings outshot the Rangers 20-3 hoping to find a winner. Henrik Lundqvist stood tall and kept the Rangers in the game. It was Willaims in OT who finally broke through, leaving the Rangers to rue over a pretty awful third period performance that left them on their heels and unable to find a potential winner.